Is there a possibility you may encounter potentially infectious bodily fluids at your job (i.e. sporting events, accident sites)? Could you be tasked with cleaning up potentially infectious materials (human waste, bodily fluids, blood, cerebrospinal fluid) at your job? Employers must ensure that their workers receive regular training that covers all elements of the standard including, but not limited to: information on bloodborne pathogens and diseases, methods used to control occupational exposure, hepatitis B vaccine, and medical evaluation and post-exposure follow-up procedures. Employers must offer this training on initial assignment, at least annually thereafter, and when new or modified tasks or procedures affect a worker’s occupational exposure. We have designed our Bloodborne Pathogens training course in such a way that it covers a wide spectrum of workers who have the potential for exposure and who need the certification showing they have met the training requirements for this particular regulation. Some of these types of workers could include waste management workers, housekeeping or janitorial staff, facilities and maintenance workers, tattoo artists and for those workers who respond to medical emergencies. 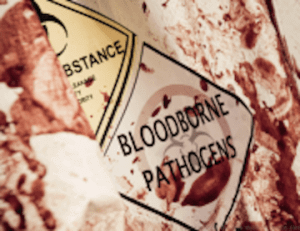 Keep in mind that while no one OSHA Bloodborne Pathogens training course can possibly prepare every worker for every type of hazard that they might encounter, this one covers a range of jobs and provides information on most of the commonly-encountered bloodborne pathogen hazards. This course is intended for those who have minor to moderate exposure and those who work in the hospital setting may need further job-specific training. Additionally, site-specific training may also be indicated for your operations. The course will provide guidance for you in these areas. Our online OSHA Bloodborne Pathogens Training course is full of interactive exercises and activities to help you fulfill the OSHA training requirements regarding Bloodborne Pathogens. All of the information is delivered in a straightforward manner with the ability to take it as time permits. Remember too that you have access to a Remote Instructor™ who is knowledgeable on the material and who can help to provide answers to your questions as well as to make the material relevant to your job. The structure and objectives of this course are centered around the requirements outlined in the HAZWOPER regulation.